These days we’re spoiled for cooperative games. From Halo to Left4Dead and most recently The Division, the modern player’s choices for playing together with friends are abundant. Wind the clock back a decade and a half, however, and the situation was very different. This post originally appeared on Kotaku UK on March 22, 2016. The entire notion of dedicated multiplayer was still in its infancy. Games like Quake III and Unreal Tournament had only just arrived, and the focus remained squarely on competitive play. For a genuinely cooperative experience, the closest you could get was playing Baldur’s Gate with a friend. Sven Co-op was originally conceived in 1998 by Daniel Fearon, a New Zealander who in the late Nineties ran a fan-site called Total Half-Life. “I guess my life was somewhat based around Half-Life at the time,” Fearon says. “We actually broke a few stories related to Half-Life.” Because of his involvement with Total Half-Life, Fearon was sent a copy of Half-Life by Valve on release, although it arrived several weeks late because it had to travel from Seattle to New Zealand. Before he’d even finished playing the game, Fearon had begun messing around with the game’s code. “I figured out how you could get monsters into multiplayer,” he says. “So I thought I’d make a map series, a cooperative map series people could play in multiplayer.” Fearon released an early version of his monster multiplayer mod with a single map in January 1999, and quickly followed it up with a two-map version. The name Sven Co-op derives from Fearon’s online alter-ego, Sven Viking. The original version of Sven Co-op launched before Valve released the Half-Life SDK, so the mod functioned mainly through some custom scripts and tweaks to Half-Life’s robust netcode. “I was also releasing about the same time a script to try to get modded multiplayer working on 56k modems,” Fearon says. Indeed, what made Sven Co-op so different from the handful of cooperative experiences around at the time was that it could be played online. This might sound like a minor consideration today, but back in 1999, having a multiplayer mod working over the internet was a huge achievement. A common misconception about Sven Co-op is that it started out as a cooperative version of Half-Life’s main campaign, but this isn’t the case. It was one of the main goals for Sven Co-op, but the Half-Life campaign came considerably later, due to the complexities of making it playable for multiple people. One of the biggest problems was map transitions. Half-Life’s single-player is broken up into separate maps that all interconnect via carefully designed level transitions. But there was no code for making these transitions with multiple players. “In a few maps you’d be stuck in the floor or something, because in normal Half-Life it remembers your position relative to a world entity, and so you end up spawning relative to where you entered the level transition. In multiplayer that didn’t happen,” Fearon explains. As Sven Co-op’s community grew, and its position as one of Half-Life’s best mods became more established, the maps created for it became more ambitious. 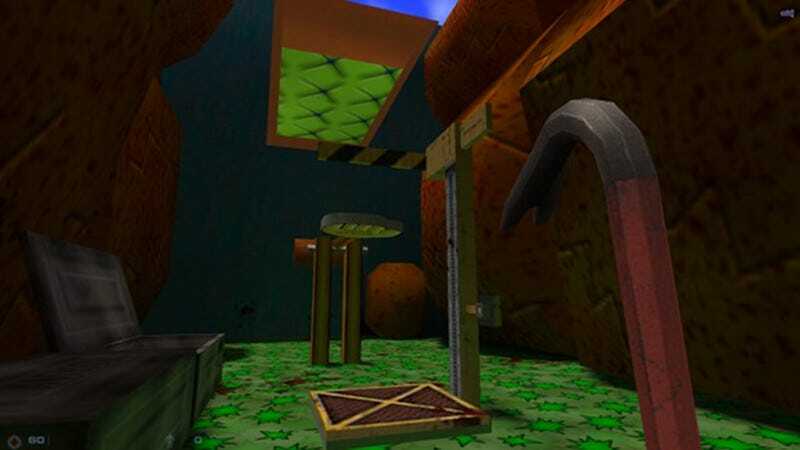 A collective favourite of all the Sven Co-op designers is Toon Run, one of the most aesthetically impressive maps built for the mod, its cel-shaded textures and bizarre contraptions resembling a Looney Tunes cartoon. Perhaps the most conceptually ambitious map is Momma Mesa. A custom-built campaign based in Black Mesa years after the disaster, Momma Mesa’s campaign is split into mission trees, sending players to different parts of the map depending on whether they succeed or fail at completing a mission. After its early successes, around 2004 Sven Co-op fell into a bit of a rut. Initially intended for release on Steam while it was still in beta, this ultimately didn’t work out because of some confusion between Valve and the Sven Co-op team. In addition, plans were underway for a full on sequel to Sven Co-op made in Half-Life 2's Source engine. “Half-Life 2 was announced and we thought ‘This time we’ll prepare everything in advance, we’ll be able to really go into development the moment it comes out’. We were kind of hoping that we might get some sort of jobs out of it or something,” Fearon says. A considerable amount of work was put into Sven Co-op 2. A large number of art assets were created, and Fearon managed to get a playable prototype running. But the delay of Half-Life 2 to November 2004, combined with a further delay in releasing the SDK, meant that by the time the resources were available to make Sven Co-op 2 happen, key members of the team had moved on, while Fearon himself had little time to dedicate to the project. “We tried to keep it going, but too many people fell away and a lot of us just didn’t have a lot of time at that point,” Fearon says. It was around this time that Fearon stepped away from Sven Co-op as leader of the project. Yet despite the setbacks with Steam and Sven Co-op 2, the original mod continued to go on strong. Maps were still being created for it, and the community collectively supported the mod’s ongoing development. Eventually, Josh Polito, who had been involved with Sven Co-op since 2002, took over as the generally accepted project manager for the mod. It was Josh, along with Dave McDermot, who organised the official Steam release of Sven Co-op in January this year. Around 2010, McDermot negotiated an engine licence with Valve, enabling them to dig significantly deeper into the code for Half-Life’s engine GoldSrc, and entitling them to official support. “We had asked Valve to upgrade things over the years like model limit, the sound limit, various weird things that affected the mod because our levels pushed limits greatly.” Then in 2012 the designers received an official go-ahead from Valve for a Steam release, although they didn’t officially announce it until almost a year later. “We wanted to release a hotfix for the current version first,” Lemming points out. When your design team is disparate, voluntary and part-time, hotfixes aren’t always so hot. Sven Co-op released on Steam in January 2016. At its peak shortly after release, it had 6,500 concurrent players, and regularly attracts 1,000 concurrent players on a weekend. Those numbers might pale in comparison to something like Counter-Strike, but given Sven Co-op is a free, unofficial mod that has been developed entirely by enthusiasts in their spare time for seventeen years, those figures are pretty impressive. “Makes you wonder why we didn’t sell the damn game,” Dave McDermot jokes. You’d think a Steam release would be a fitting culmination for 17 years of work, that the developers might take a break and possibly begin thinking about other projects. But you’d be wrong. The fires that have kept Sven Co-op running for so long are still burning, and the designers have some pretty ambitious ideas for the mod in the future. Alongside the addition of AngelScript, the designers want to enable players to create their own HUDs, replace all of Half-Life’s old AI pathfinding, and even upgrade the game’s graphics to take advantage of modern hardware. The long-term plan is to transform Sven Co-op from a series of co-op maps into a creative design sandbox, not entirely unlike Garry’s Mod. “The ultimate goal is to make it possible for the community to basically make the game,” says Polito. Beyond that, none of the current team have any plans to end their association with Sven Co-op. Indeed, it’s entirely possible that the game will continue running for another 17 years. “Everyone on the team has a lot of ideas still. Once those ideas are gone, when everyone has done their ideas, at that point everyone will just kind of run on auto-pilot and we’ll just kind of maintain it,” concludes Dave McDermot.